The WMicroTracker measures overall locomotor activity and viability of your worms such as C. elegans and parasitic nematodes cultured in liquid media and in multi-well plates. Its nonlabor-intensive automated assay is capable of providing a simple overnight readout which requires no additional processing . This system is optimized for measuring C. elegans in liquid media and is also designed for high-throughput screening assays to evaluate the biological effects of potential compounds/drugs, as well as for mutant phenotyping studies in small nematodes. Automatically measure worm movement in both large and small populations . Perform live worm assays for several weeks at a time with high reproducibility of data. Load your experiment, set your parameters and walk away. Your data will be ready for you at the end of the programmed time. The WMicroTracker gives you data comparable to a thrashing assay, only 10 times faster. The WMicroTracker quantifies the locomotor activity of a worm population in a 96 well plate with 30-70 animals per well. Data acquisition and analysis are automated and simultaneous. All activity is normalized to N2 controls. Toxicity assay. The dose-response effect of oxidative stress on C. elegans locomotor activity over time can be observed. Worms were exposed to a reactive oxygen species (ROS) generating compound. Each concentration was tested four times, using 30-70 animals per well in a 96-well plate. Lifespan assay. 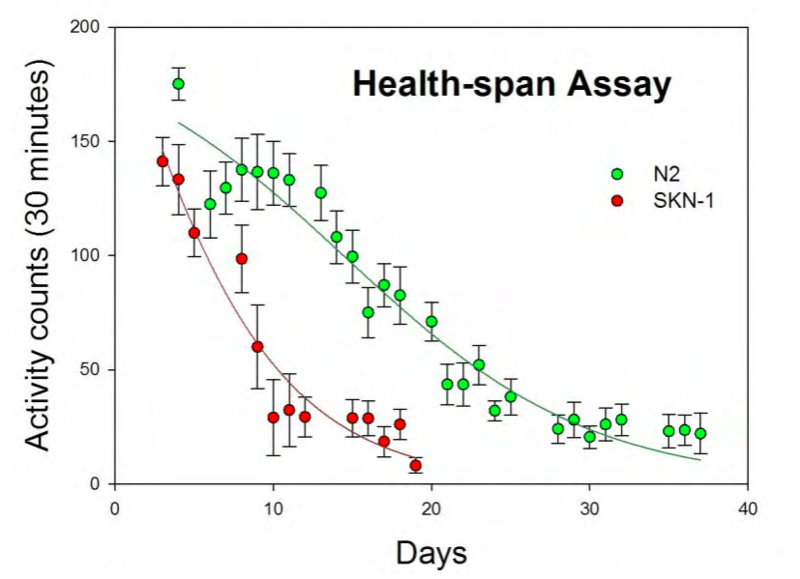 The decreased lifespan of skn-1 mutants can be observed. Samples were recorded for 1 hour once per day, four times per condition. Caenorhabditis elegans Infrared-Based Motility Assay Identified New Hits for Nematicide Drug Development. Risi G, Aguilera E, Ladós E, Suárez G, Carrera I, Álvarez G7, Salinas G. Vet Sci. 2019 Mar 17;6(1). pii: E29. C. elegans Development and Activity Test Detects Mammalian Developmental Neurotoxins. Piper Reid Hunt; Nicholas Olejnik; Keenan D. Bailey; Cory A. Vaught; Robert L. Sprando. Food Chem Toxicol. 2018 Nov;121:583-592. Active principles of Tetradenia riparia. IV. Anthelmintic activity of 8(14),15-sandaracopimaradiene-7α,18-diol. Luc Van Puyvelde; Maoxuan Liu; Cedrick Veryser; Wim M. De Borggraeve; Joseph Mungarulire; Marie Jeanne Mukazayire; Walter Luyten. J Ethnopharmacol. 2018 Apr 24;216:229-232. Rescue of ATXN3 neuronal toxicity in C . elegans by chemical modification of ER stress. Fardghassemi Y ; Tauffenberger A ; Gosselin S ; Parker JA. Dis Model Mech. 2017 Dec 19;10(12):1465-1480. A rapid chemical ­genetic screen utilizing impaired movement phenotypes in C . elegans : Input into genetics of neurodevelopmental disorders. Schmeisser K ; Fardghassemi Y; Parker JA. Exp Neurol. 2017 Jul;293:101-114. Twitchin kinase inhibits muscle activity. Matsunaga Y ; Hwang H ; Franke B ; Williams R ; Penley M ; Qadota H ; Yi H ; Morran LT ; Lu H ; Mayans O ; Benian GM. Mol Biol Cell. 2017 Jun 15;28(12):1591-1600. Neurodegeneration in C. elegans models of ALS requires TIR-1/Sarm1 immune pathwayactivation in neurons. Veriepe J ; Fossouo L ; Parker JA. Nat Commun. 2015 Jun 10;6:7319. Twitchin kinase interacts with MAPKAP kinase 2 in Caenorhabditis elegans striated muscle. Matsunaga Y ; Qadota H ; Furukawa M ; Choe HH ; Benian GM. Mol Biol Cell. 2015 Jun 1;26(11):2096-111. Insulin/IGF-1 receptor signaling enhances biosynthetic activity and fat mobilization in the initialphase of starvation in adult male C. elegans. Tan KT ; Luo SC ; Ho WZ ; Lee YH. Cell Metab. 2011 Sep 7;14(3):390-402. 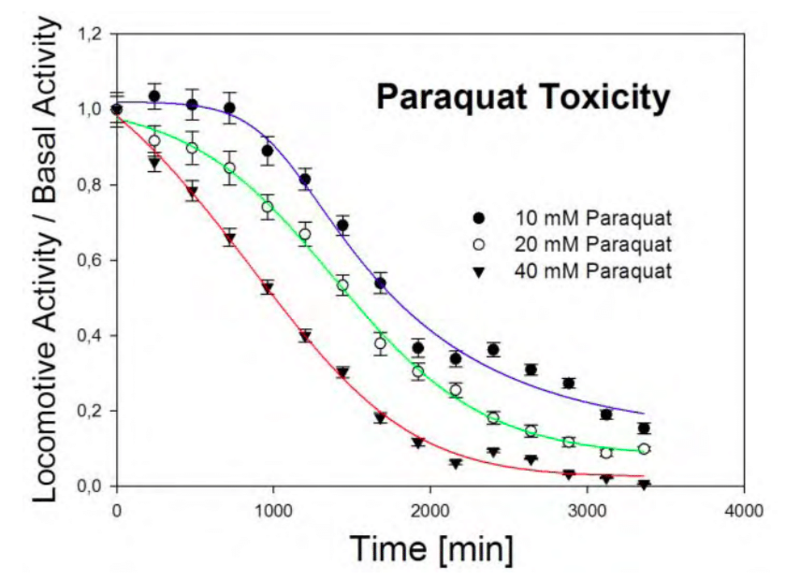 Bioassay-guided isolation of three anthelmintic compounds from Warburgia ugandensis Sprague subspecies ugandensis, and the mechanism of action of polygodial. Liu M, Kipanga P, Mai AH, Dhondt I, Braeckman BP, De Borggraeve W, Luyten W. Int J Parasitol. 2018 Sep;48(11):833-844. Screening of a drug repurposing library with a nematode motility assay identifies promising anthelmintic hits against Cooperia oncophora and other ruminant parasites. Liu M., Landuyt B., Klaassen H., Geldhof P., Luyten W. Veterinary Parasitology. 2018 Dec. The nervous and prenervous roles of serotonin in Echinococcus spp. Camicia F, Herz M, Prada LC, Kamenetzky L, Simonetta SH, Cucher MA, Bianchi JI, Fernández C, Brehm K, Rosenzvit MC. Int J Parasitol. 2013 Jul;43(8):647-59. Unique pharmacological properties of serotoninergic G-protein coupled receptors from cestodes. Rosenzvit MC et al. PLoS Negl Trop Dis. 2018 Feb; 12(2): e0006267.